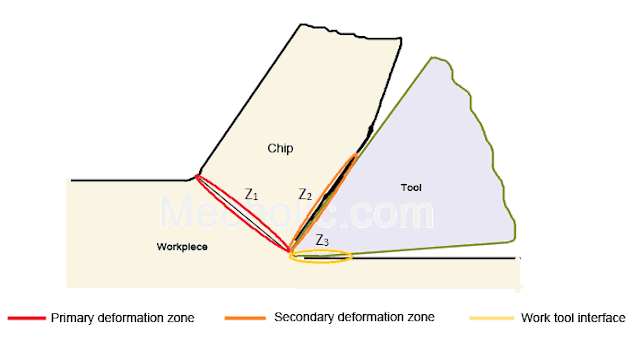 Shear zone is the where the plastic deformation occurs. This is where the maximum heat (80 - 85%) produced, almost all heat generated by plastic deformation is carried away by chips. Only a small fraction of heat is get conducted into the workpiece and into cutting tool. 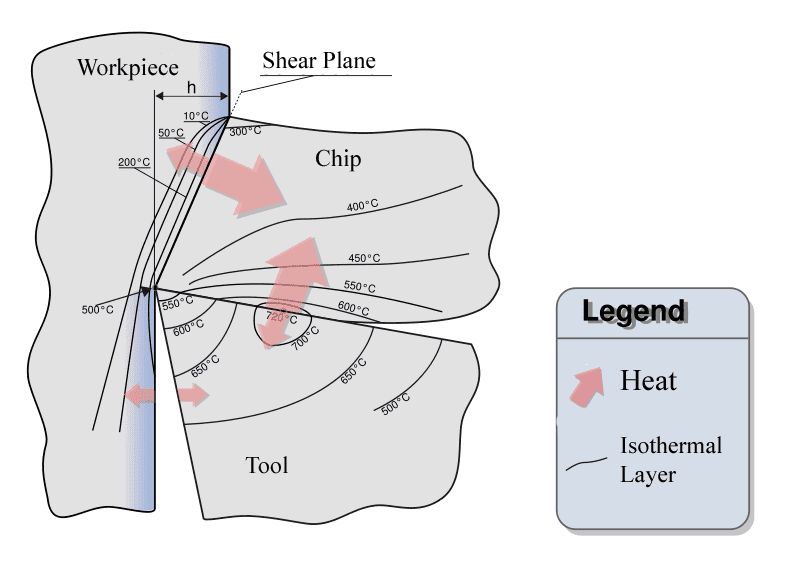 Hence chip is the hottest portion of metal machining. In chip-tool interface, friction between the moving chips and the tool rake face is the cause of heat generation. The chip also subjected to secondary plastic deformation. About 15% heat generated in this region. Heat generation at work-tool interface zone is due to burnishing friction between the flank face of tool and workpiece (1-3% of the heat generated). The heat of this zone increases with time because of increasing of wear land on tool. The figure indicate the heat flow in metal cutting. The maximum amount (80%) of heat generated in these zone is flows to the workpiece/ chip. The maximum temperature is not at the tip of the tool but some distance further up the rake face. Remaining heat flow into tool (15-20%) and workpiece (5%). The more the heat absorption by chip, less harm to the tool and job. The feed and depth of cut do not have a great effect on heat generation. The cutting speed is an important parameter affecting the cutting temperature. 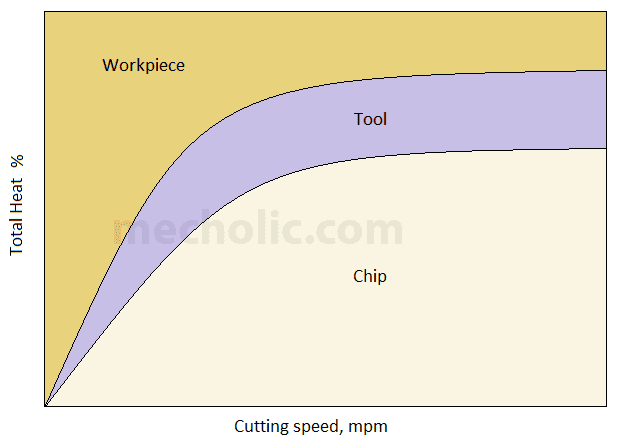 The typical distribution of heat of cutting tool, workpiece and chip vs the cutting speed is shown in figure.